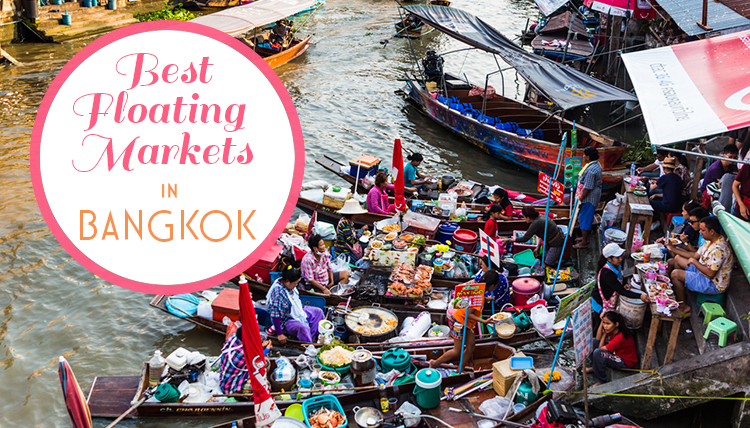 Thailand’s colorful floating markets remain a unique part of Thai culture and should not be missed on any first visit to Bangkok. 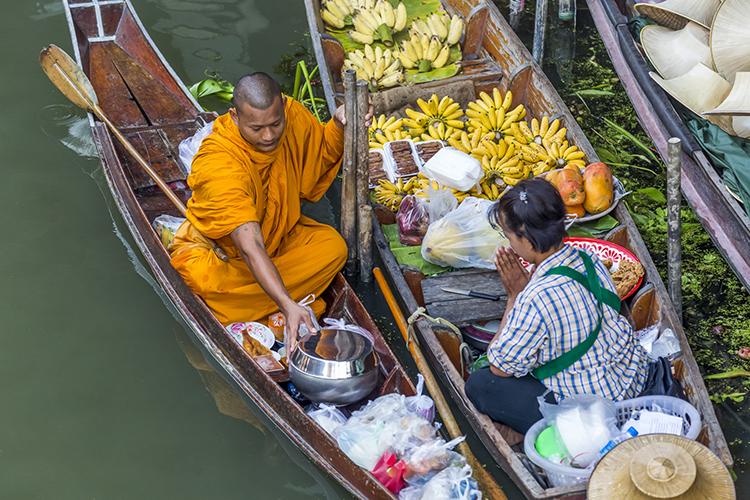 While the tradition of merchants trading their goods in canoes along crowded canals began many years before roads existed, it remains today as a method of distributing produce and wares, not to mention a great choice for lunch and sampling Thai delicacies. 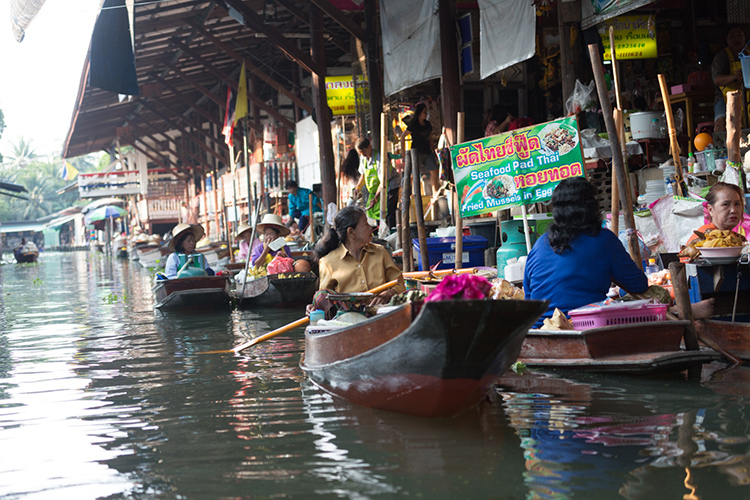 Nearest to Bangkok proper are the floating markets of Taling Chan, Wat Sai and Khlong Lat Mayom. 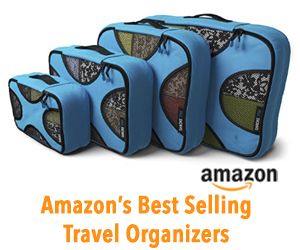 If you are pressed for time, one of these might be your only option. Damnoen Saduek is perhaps the most popular floating market in Thailand and was developed primarily as a tourist attraction. All of the tourist buses go here and you’ll see instantly that it is a tourist hot spot. In my opinion this market is best when visited in the early morning before the tour buses arrive. Handicrafts and other souvenirs of the region abound at the Damnoen Saduak floating market. 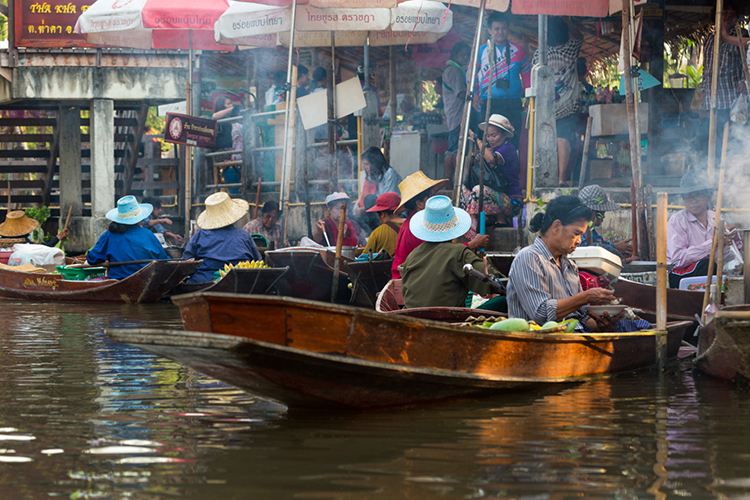 The best floating market for those in search of a local vibe is called Tha Kha, located roughly 2 hours from Bangkok. Typically there are no tourists in the early morning, only the vendors in their boats and locals whom have come to buy produce. While Tha Kha is smaller than the other floating markets there is no question which is the better choice; it really is off the beaten path and that’s where my favorite travel experiences happen! Read reviews about the Tha Kha market on TripAdvisor here. At the Tha Kha floating market you can enjoy fresh dishes such as papaya salad, boat noodles and coconut rice dumplings. Tourists are a rare sight at the Tha Kha floating market which is mostly shopped by locals. Hiring a taxi to get from Bangkok to Amphawa is the easiest option (though expensive) but you may want to check with your hotel as they sometimes offer private transportation for a discounted price (which is what I did). 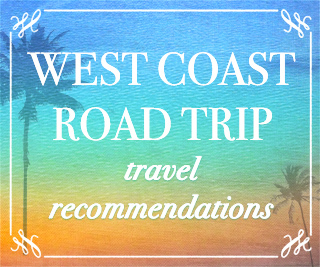 Alternatively, you can take a city bus from the Southern Bus Terminal to the Samut Songkram town and then hire a taxi or tuk-tuk to the floating market, a journey which will take approximately 2 hours in total. 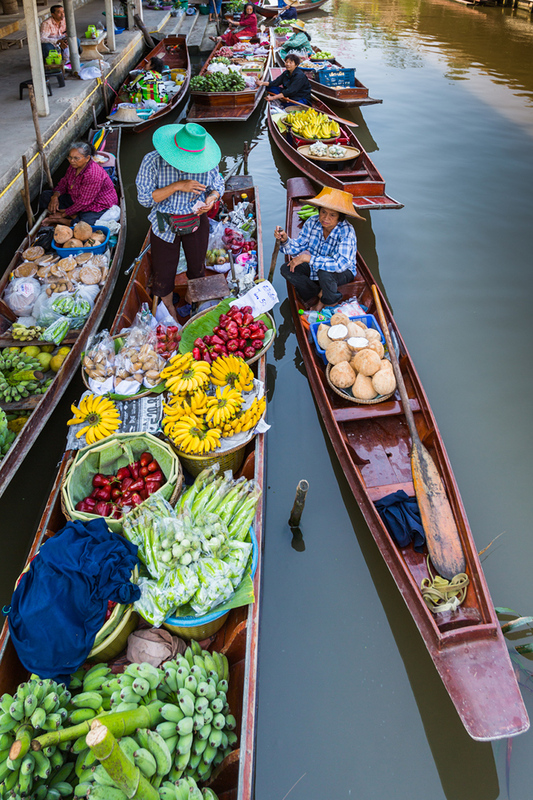 If you are determined to experience the best floating markets that Bangkok has to offer and perhaps get some great travel photographs, you probably want to stay the night in Amphawa allowing for an early morning at the market. I recommend the Baanrak Amphawa homestay which is located right on the canal just a short walk from the Amphawa market, or a short tuk-tuk ride from the Tha Kha market. 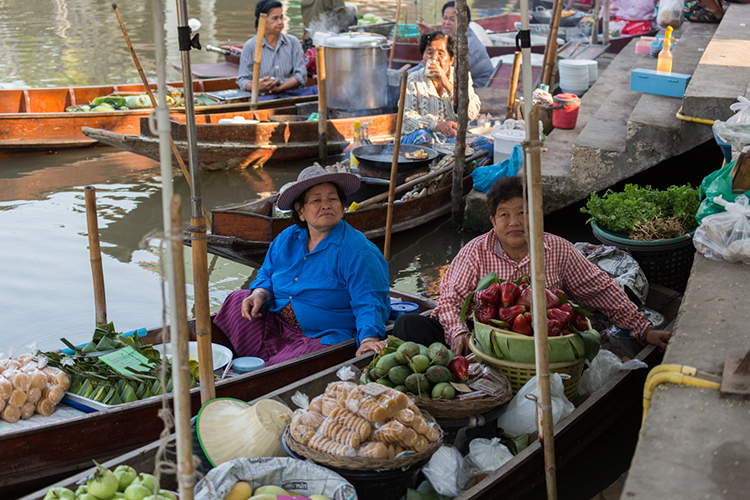 Tha Kha floating market is an excellent place to sample Thai specialty foods. Come hungry! Get there early for a chance to witness scenes like this one. 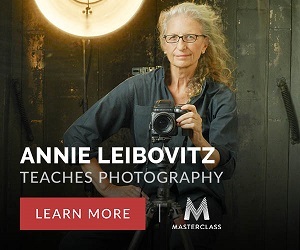 Photography and travel recommendation by David C Phillips © 2017. 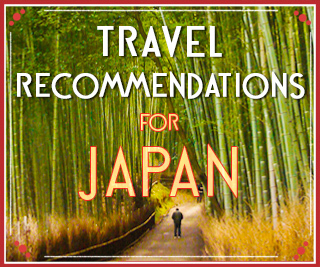 Follow David’s vibrant travels on Instagram: @photosbydcp.